With a second look, a dual – and darker – story emerges. Juxtaposed against the stereotypical images of a happy housewife, a seductive 1920’s-era vamp and the archetypal whipped cream-topped chocolate dessert in a tulip sundae glass, Grossman has placed text that speaks of disappointed marital expectations that turn ultimately to spousal abuse. This spread is captioned, “She tried to be a perfect wife in every way.” Additional text, which appears to have been cut from magazines or newspapers, includes cooking terms that come to have sinister connotations: “whip,” “break” and “yield.” As things move along, the double meanings multiply, wedding the humorous to the disquieting in both imagery and narrative. The tale accelerates as the woman, who really does try hard to be an ideal wife, is beaten by her husband for no reason. In the end, the battered wife retaliates, using her culinary skills in the process. She concocts a poisoned cake that kills her husband. 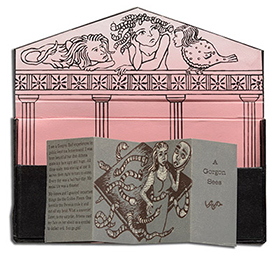 Bad Girls is the ironic title of Stephanie Copoulos-Selle’s book relating, in jocular contemporary language and amusing cartoon-based drawings, the stories of the Sphinx, the Sirens and the Gorgons. The over-arching theme of these disparate female figures is their role as guardians who, in one way or another, wind up dying by simply doing their jobs, thanks to the intervention of men. Even as she critiques the traditional depiction of strong women as overbearing if not positively evil, Copoulos-Selle keeps the tone of both the drawings and text lighthearted and humorous. emblems of feminine connivance and protracted evil, she creates delightfully petulant characters that appear briefly in the miniature theater of her book to dish out their comic lines of discontent with dashes of pointed sarcasm. Overall, it is an ingenious and entertaining way to encourage a reevaluation of the wrong-headed handed-down values attached to female mythological figures. There are many metaphors for gender bias, from “glass ceiling” to “workplace labyrinth.” All connote a barrier that is impossible, or at best, difficult to breach. Women Dream by Elsi Vassdal Ellis is an exploration of the boundaries – the visible and invisible walls – that women confront. Vassdal Ellis contemplates this idea in the context of three religions: Islam, Christianity and Judaism. The work consists of three nested boxes from which, when the lids are removed, the walls fall out flat. The walls are connected by tulle, a delicate and feminine material. 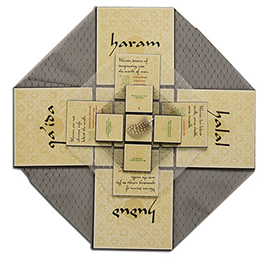 The sides of the outer box are printed with mosaic-like patterns overlaid with the Arabic words haram (sinful), halal (that which is permissible), hudud (limit or restriction) and Qa’ida (the base).